I’ve always been a Barbie girl, I can’t lie I probably played with them way too long. I spent hours brushing their hair, changing their clothes, deciding who would be their boyfriend, and of course making clothes for them! I couldn’t wait for my daughter to be old enough to get into Barbies, it’s one of our favourite things to play! I’m kinda a sucker for the ‘Mommy please eyes’ so when she dreams up the next best thing for her dolls, Mommy usually jumps (ok, maybe I thrive on it?). The latest request, Barbie and her pals wanted to be poolside! I scrounged around for what I could make work… a clementine box, a ribbon spool, and scrap of 2 x 4, that could be something, right? A little coat of paint, pretty paper, and a bit of ribbon really go a looong way! 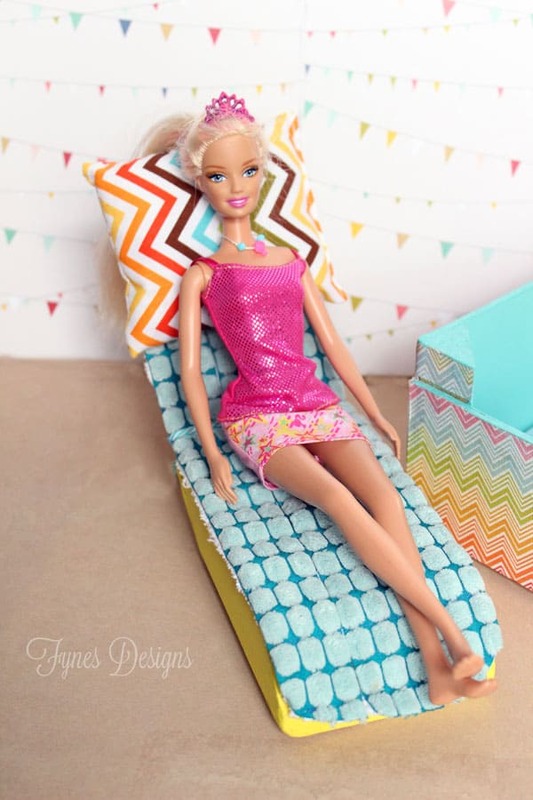 Barbie looks so relaxed, doesn’t she?! Now here is the exciting part! Barbie is appearing in another film, and she wants all her friends to join in for the Movie Premiere of Barbie The Pearl Princess! What an awesome way to kick off March Break! You can receive an exclusive invitation to Barbie The Pearl Princess Premiere Screening by visiting the Barbie My Dreams website to download FREE tickets to select Canadian theatres (while supplies last). The premiere will be held in Mississauga, Etobicoke, Scarborough, Stoney Creek, Ottawa, ON; Halifax, NS; Edmonton, Calgary, AB; Langley, BC. Saturday, March 8th at 10:00am! Downloading the tickets is really easy. You will be prompted to sign up for an account, post a Dream to the Dream Board (kinda like Pinterest for Barbie fans) then you’ll be eligible to receive Free Movie tickets!! In addition to the Free movie ticket offer, Barbie is also hosting a ‘Express Your Style Contest’. The contest is a way for the biggest Barbie fans to show off their personal style for their chance to WIN. You will find further details for the contest on the Barbie My Dreams website. I have to let this cat out of the bag… the grand prize is a trip for four to Toronto for an unforgettable shopping experience!! 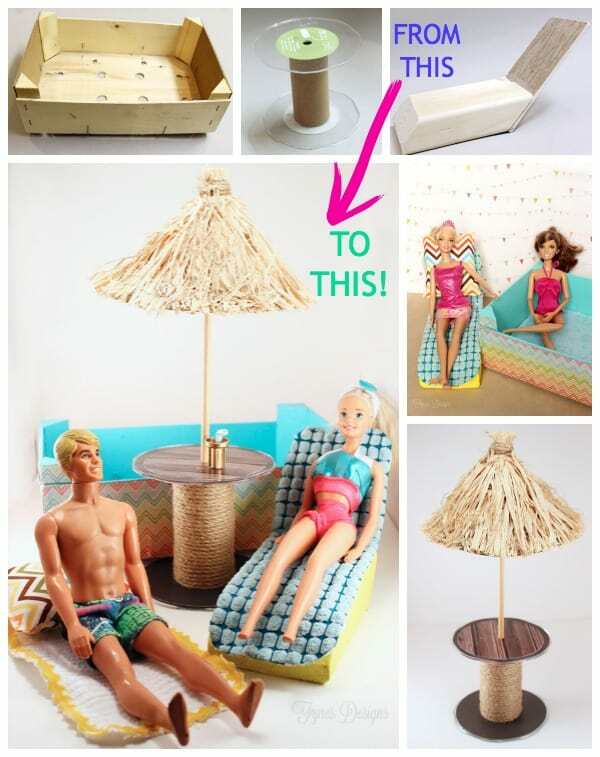 Love the Barbie stuff you made. I played Barbies until I was 12 or 13, loved them so much. Would love to take my daughter Morrina to see the movie. Very cute! Great way to repurpose reuse and recycle. Love it! Remember when you made a whole barbie wardrobe for Brooky?! I totally forgot about that! Good memory!! I would take my kiddos, because they’d be thrilled to see Barbie on the big screen. They’re both HUGE fans! My daughter Callie would LOVE going! I love the Barbie spool table! My daughter would love to go!! I would take my daughter & my cousin who crochets beautiful gowns for Barbies and her daughter, what a great giveaway! Thats such a sweet idea Zelda! I would take my neice!!! Yay for Barbie, she’s such a doll and thanks for the giveaway – looks good! Would love to take my niece to see this movie! ♥ I would be her favorite Aunt (at least for the day). I would take my nieces!!! That poolside scene is just amazing VIrginia! Makes me want to pull out my girls’ old dolls and play! Thanks Dani! There is a reason I don’t mind playing Barbie!